Elise Strachan has become a household name in the world of sweets, attracting the attention and hearts of millions with her YouTube channel My Cupcake Addiction. An Australian who divides her time between the Gold Coast, Los Angeles and New York, Elise's impressive background as a trained pastry chef, her engaging character and her accessible approach to all things sweet has her globally revered as the 'People's Baker'. This animated mother of two shares her passion for baking with her family, friends and community in a way that encompasses the idea that 'Life is Sweet!' An avid traveller, Elise also shares her adventures in discovering the world's most delectable desserts and showing her fans the must-go places to get them. I really loved that it was a hardback book and not flimsy. It was easy to read, informative and was filling with helpful baking tips. 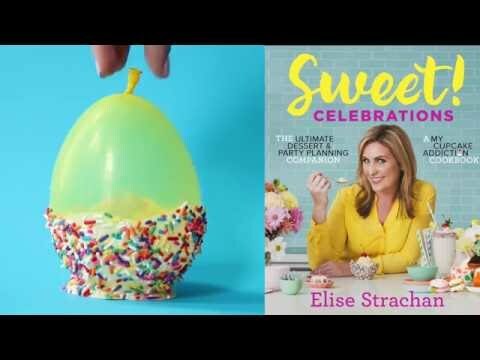 Beautifully presented sweets cookbook that shows step by step how to create a sweets sensation as shown by Elise Strachan on her social media pages. Sectioned off for holidays seasons, borthdays and other special occasions, this book is magic and more than I expected. Not what I was expecting but love it! I thought there would be more creative cupcakes recipes in the book. It's still very informative and has many awesome recipes/ideas. It's an awesome book with loads of ideas that are fun and mostly easy to copy!! Love this book!! Can't wait to make something from the book.